Interested in trying out AISpace2? Get started here. We’re happy to have you here. Follow the steps below and you’ll learn how to get setup with Jupyter and the AISpace2 extension. We highly recommend using a modern and up-to-date browser for the best experience, such as the latest versions of Edge, Firefox, Chrome or Safari. Are you a UBC student or have access to a JupyterHub instance (which allows you to access Jupyter by going to a URL)? If so, you can use this extension with Jupyter online without installing anything on your computer →. Otherwise, you can install it locally if you have macOS → or Windows →. If you are running Linux →, we have a general installation procedure. Using JupyterHub means you won’t have to install anything on your computer — everything takes place online. Go to ubc.syzygy.ca if you are a UBC student, and sign in with your CWL. Otherwise, go to wherever your JupyterHub instance is located and sign in. Click Start My Server when prompted. Launch a terminal instance. You can do this in the notebook dashboard by selecting New > Terminal. Move on to the Get the Notebooks section. If you are unfamiliar with the Python ecosystem and want the simplest installation, use Anaconda →, a Python distribution with a lot of scientific computing tools already pre-installed. If you already have Python installed, or would prefer to install everything yourself, go here →. 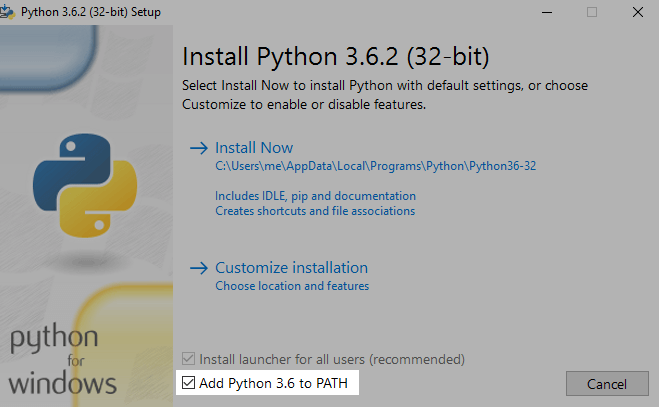 Download Anaconda for Windows, making sure you select the Python 3+ version. Run the downloaded installer. The default options are fine. Open the Start menu and search for "Anaconda Prompt". Open it. Enter ‘y’ when prompted to confirm the installation. Move on to the Running JupyterLab section or the Running JupyterNotebook section. We recommend using JupyterLab. If you know that you don't have Python 3.3+ installed, go here →. then Python was not added correctly to the path. You can fix this by either following the instructions here, re-running the Python installer for the exact same Python version you have (select Modify, make sure pip is selected on the next screen, tick Add Python to environment variables on the screen after that, then click Install), or installing Python again from scratch →. Download the latest version of Python 3. It should be version 3.3 or later. Install it, and make sure you select Add Python to Path. This is very important! If you are unfamiliar with the Python ecosystem and want the simplest installation, use Anaconda →, a Python distribution with a lot of scientific computing tools already pre-installed. Otherwise, if you prefer installing all the dependencies yourself, go here →. Download Anaconda, making sure to get the Python 3+ version. The Python 2 version is not supported. You also want to make sure pip is updated: run pip3 install --upgrade pip. Your pip3 --version should be >9.0.0. If you encounter any problems with pip, refer to the guide here for further instructions. You will need to install Python 3.3+. You will need to install nodejs and npm if you do not have them already installed. You can find installation instructions here. You should now move on to the Get the notebooks section. If you are using node 10 and your installation of the aispace2 labextension hangs, try to install it using node 8.
in the same terminal as where you will be installing the extension. This will launch Jupyter Lab in your default browser. We recommend that you view the widgets using Chrome. After you run jupyter lab, the url at which the jupyter notebooks are running will be printed out in the terminal. You can copy paste this url into Chrome. Make sure to restart Jupyter after doing this for the changes to take effect.